Caped Crusaders? | Lord...What's My Motivation? There is something about masks that I’ve always found very intriguing. I don’t think you’re a true theatre person if you don’t like the occasional trip to the Halloween store and the smell of manufactured latex. From a theatrical stand-point, I’ve always been intrigued by the function of a secret identity and how it plays into a story, character or circumstance? Fun stuff. Superheroes immediately come to mind. Halloween too. Bank robbers, I suppose fall into that category. Then I thought about how that particular “art” imitate life (to take a giant slice out of that drippy, cliche pie.) Then I started thinking about the masks we all wear, everyday. 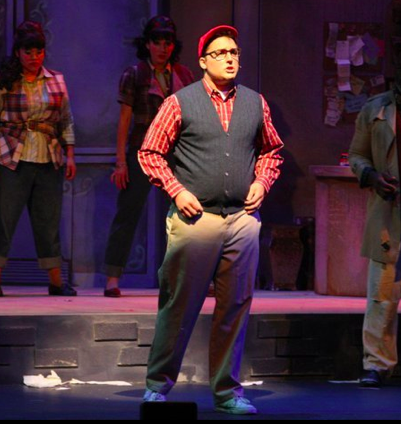 I’ve had the pleasure of working with a phenomenal cast and crew of “LITTLE SHOP OF HORRORS” for the past few months. The show runs until August 27. (Summerlin Library / Performing Arts Center – For Tickets: http://www.SignatureProductions.net.) With that said…it doesn’t feature any superheroes (although I suppose that’s arguable, in the figurative sense)…no references to Halloween…and no bank robberies. But, I’ve found the exploration of the main character, Seymour, to be very much like how we go about our lives: trying to reach that unattainable goal, scared of the circumstances, and ultimately hiding our true selves in the process. Seymour is an underdog. Someone an audience member would want to root for. He’s brow-beaten. He’s only known the gutter. And here walks in a beautiful young lady who is simply out of his league. She’s abused, humiliated and a tower and a dragon away from being a textbook damsel. Any audience who wouldn’t yell “grab a sword, Seymour and rescue yon maiden!” is missing something. The plot is what one might call…a bit predictable. The reason I like the musical so much has to do with Seymour. Sure, it’s a plight we’re all accustomed to. Sure we can imagine what might come next. But, here’s a guy who is willing to change his ways, and ACT on his feelings…to do what he thinks is right. You see it doesn’t matter if it IS morally right…or ethically right. All that really matters is that the character THINKS its right. That’s what creates such affective heroes and villains. The mask I wear in front of my high school drama students is not the same mask I wear in front of my boss, or my next door neighbor or a police officer who just pulled me over. All are different (and perhaps a simpler) adventure then, say, Seymour’s…but the act of donning a different personality to do what’s “right” is very much the same. Okay, now let’s take two giant steps back. Ever been to Comic Con? I haven’t. I don’t collect comics…but I find them amusing. I have a deep respect for those who love comics, science fiction and fantasy. I think there is a place in this world for those whose energies are drawn to projects and efforts that are outside the realm of reality. In my eyes…that’s a hiccup away from theatre. You ever wonder why people get such a thrill from dressing up and invading these conventions with their painted squirt guns and way too tight tights? “Whoa! 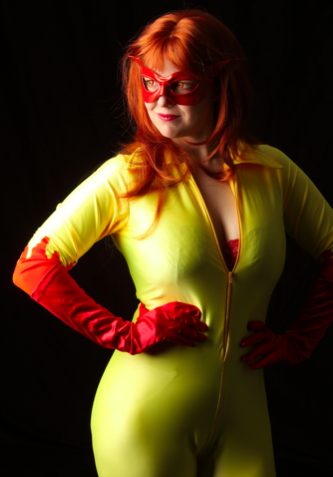 Don’t get too close to that crazy chick who is spilling out of her unitard and trying in vain to convince us she’s Firestar! The situation may be combustible.” Yes. Combustible. Heh. One thing that I’ve noticed about these Comic Con crazies is their willingness to don a mask (physical or otherwise) to completely immerse themselves into a character for the sake of an event…or rather a “coming together of like crazies.” This fascinates me, but not for the reasons you think. For the same reason I can enjoy the occasional Renaissance festival, but I would never keep an outfit of guilded, rustic armor in my hope chest in anticipation for the next event….I think Comic Con, Renaissance festivals, and even the first day of school (which is a mere week and a half away for me….yikes) all fall under the same category: they are meetings of like individuals, with common passions and a willingness to don a mask so as to create an acceptable character in the hopes that the performance will be well received. Arguable? I bet you ever teacher at Faith Lutheran has purchased their new outfit for the first day. My shirt (costume) is red. As you waltz into Comic Con as Firestar (or rather, Math class as Jeff)…take a look at the wonderful fun house that surrounds you. All the lush characters and fun masks. Please remember that underneath each one lurks an actual person….with passions, feelings and secrets. Perhaps if we embraced this…it would bring worlds together and make wearing capes socially acceptable! I don’t think you need superpowers, Excalibur or a stage to do that. This entry was posted on August 13, 2011 at 5:26 pm and is filed under ACTING ONSTAGE, THE HIGH SCHOOL THEATRE CLASSROOM with tags audrey, Bank robber, Batman, capes, comic books, comic con, Community theatre, crusaders, excalibur, faith crusaders, Faith Lutheran, faith lutheran high school, firestar, first day of school, freshman, Halloween, little shop of horrors, masks, musical, renaissance festival, seymour, seymour krelbourn, Signature Productions, superheroes, Superman. You can follow any responses to this entry through the RSS 2.0 feed. You can leave a response, or trackback from your own site.